The reversed nature of a blog makes it somewhat hard to follow a larger topic back through the time. To make it a little easier I decided to create this page were I will basically provide links to the original blog posts but in chronologically order. Additionally I will summarize each post to help in finding required information and interesting topics. Answers the following Question(s): Why am I doing this? Where came the inspiration from? Q: What were the requirements for my ideal keayboard? How do you mount Cherry ML key modules on stripboard? Q: How does polling / scanning a keyboard matrix work? What was the key layout I decided initially upon? Q: What is bouncing? How do I debounce the keyboard matrix? Just showing a picture of the final version besides my MacBook. Q: Why did I choose the Arduino Uno? What were the drawbacks and problems I faced? Q: Which parts did I use? How much did everything costs? 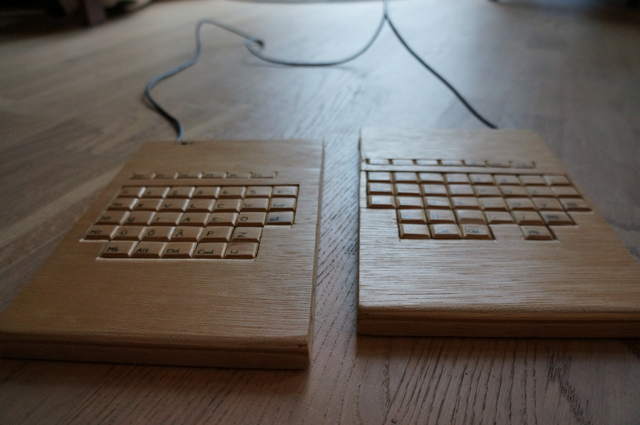 How much time did I spent building the keyboard? Q: How did I program the communication with the computer using raw HID packages? How did I translate the key presses from the Neo2 layout of the keyboard to the standard layout of the host? Q: Why did I fail establishing wireless communication between the keyboard parts? What did I try to get it working? Q: How I configured a BlueSmirf HID as a combo device? How I read a thumbstick and send raw mouse packets? Q: How I set up a basic protocol for sending key presses and mouse moves across the wire? Q: How to use a force sensing resistor and the Arduinos interrupt pins? How to circuit a LM358 to trigger the interrupt? Q: What did I achieve? What would I do different the next time? Just a link to a YouTube video featuring me typing on “TheTasTaTur Mark1”. Post Nr. 15 – Ever thought about patents? you did really messed up with my pocket!!! Pingback: Welcome to a new friend: Dirk Porsche : Shiggy Enterprises | Things That Will Make Your Life A Little … Different … | Hey Sweetheart, Get Me Rewrite!